Additional Info: Considered to be the most beautiful country in Eastern-Europe with its majestic castles, medieval towns and great hiking and wildlife. 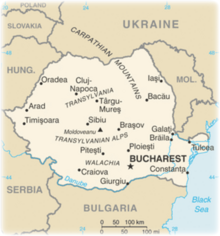 Romania's terrain is distributed roughly equally between mountainous, hilly and lowland territories. The Carpathian Mountains dominate the center of Romania, with fourteen of its mountain ranges reaching above the altitude of 2,000m. The highest mountain in Romania is Moldoveanu Peak (2,544m). In south-central Romania, the Carpathians sweeten into hills, towards the Baragan Plains. Romania's geographical diversity has led to an accompanying diversity of flora and fauna. It is easy to find a great hiking trail. Romania has more than 400 parks and nature reservations protecting hundreds of species of flora and fauna. The variety of terrain, from mountainous to gentle, offers something for every hiker regardless of skill or level. Sinaia is one of the most beautiful mountain resorts of Romania, combining natural beauty with picturesque architecture. The town was named after Sinaia Monastery, around which it was built; the monastery in turn is named after the Biblical Mount Sinai. King Carol I of Romania built his summer home, Peles Castle, near the town. For a day hike, head to Dog's Peak hut, hike up to 5,440ft, the view is spectacular overlooking the mountains and the Baiu Mare Peak at 6,260 feet. For an alternative hike, drive to Predeal, and hike up to the Dihan hut; continue to Poiana Izvoarelor lodge, a beautiful path leads to spectacular scenery over Bucegi peaks - an easy hike of about 4 hours. With a terrain that ranges from steep and challenging to gentle and pleasant, Romania offers bikers of all skills and levels something to enjoy along its bike trails. Magnificent scenery offered by trails through woods or traditional villages invite bikers to stop quite often. Best cycling times are the mild months of May and June, and September. Bike-Romania and Eurovelo are trying to improve the signposting and cycle routes in Romania, so keep an eye on their websites for updated information. Roads can be rough so choose a sturdy bike or mountain bike and bring spares - only larger cities will have bike stores. Except for international trains, you can take your bike on trains as long as it has a baggage car, where your bike will be stored complete with an address label. On trains without a baggage car you are left to the nature of the train conductor. Bicycles are not readily available for renting. Below are some extracts from an excellent resource on cycling in Romania. Bihor - or Apuseni Mountains: the foothills are reached a few hours after cycling over the border. Not too high, but large and very peaceful. There are plans to make this area a national park. There are (literally) thousands of caves (mostly unexplored) and beautiful karst-phenomena like underground glaciers and enormous sinkholes (dolinas). These attractions are relatively easily reached from the hut at Padis or the beautifully situated campsite at Poiana Glavoi, both situated on the plateau, a few hours of sweat from the foothills. Padis and Glavoi are accessible by car, but make sure it's a sturdy one as there's no asphalt on the steep access road. The campsite is very basic (no water except for the stream flowing through the valley, no toilets except for the forest), but there usually is a small 'buffet' (also one at Padis) selling drinks and sometimes bread. 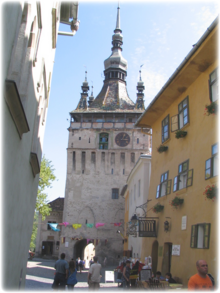 Maramures - this region in the north between Baia Mare and the Ukrainian border is most definitely worth visiting. Nowhere else in Europe have the traditions survived modern life so well. Maramures offers beautiful wooden architecture (unique churches, houses and water mills in practically every village), a rolling hilly landscape full of ploughing, sowing or reaping peasants, extremely friendly people, traditional folk clothes (often also on weekdays, and not yet only worn for tourists) and many age-old festivals and traditions. Near Sighetu Marmatiei there's the Merry Cemetery of Sapinta; accessible for cyclists and hikers over the forest track northwards from Baia Mare.